Would you like to have the ability to automatically and in a controlled way, discharge virtually any powder type in your facility? With this innovative equipment either integrated into your existing process or as a new system set-up, you will be able to maintain a homogenous blend through to packing. In addition, sealed, mobile Intermediate Bulk Containers (IBCs) give you shorter change over times and reduced cleaning between shifts. This all increases your ROI. With the use of our technology within your powder handling system, you can future-proof your assembly line. How You Will Benefit from Using a Matcon Powder Handling System? Parallel processing - formulate recipes whilst other equipment is in use. Reduce cleaning time - you no longer need to shutdown the line between every recipe changeover. Fulfill high demand orders using flexible manufacturing equipment. 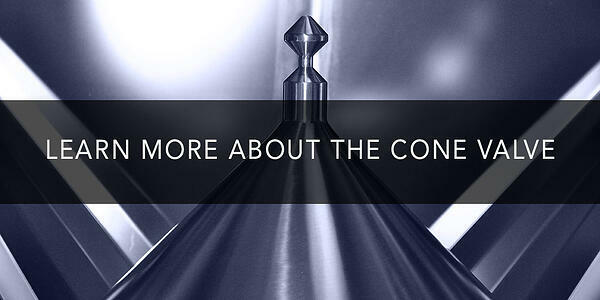 Easily handle difficult to control powders - using Cone Valve technology. Perform almost instant recipe changeovers - using Intermediate Bulk Containers. If you need to produce high volumes of the same products, then a continuous, automated processing line may suit your facility. However be aware that this type of system can be hard to clean and if a recipe changeover is required, then it is likely that the whole line will need to be shut down, taken apart, cleaned and then given time to dry before re-assembly. Using Intermediate Bulk Containers (IBCs) as part of a Tumble Blending System will allow you to perform multiple recipe changeovers through a traditional shift and reduce the risk of cross contamination. The tumble blending approach uses the IBC as the blending vessel, therefore the powder ingredients are not in contact against blades or paddles. The recipe is also fully contained to stop dust and wasted product. As the IBC is used to blend all ingredients, the blender does not need to be cleaned as part of the changeover, saving you valuable production time. Once each IBC is blended, it can be taken from the blender and moved onto the next production stage. Cone Valve Technology overcomes a variety of powder handling problems from bridging, rat-holing and blockages to segregation and core-flow. They provide automatic and controlled discharge of virtually any powder types through an integral cone vibration system. Every type of powder can flow smoothly and cohesively, giving you ultimate control of your discharge process. Preserve your blend homogeneity throughout the transfer process – essential for consistency and quality across your product range. Eliminate risks of powder segregation and bridging. Control the flow of your powders by using the variable lift height mechanism within the Cone Valve, allowing free-flowing difficult-to-handle powders to be used without the need for additional feeders. Experience a dust-free atmosphere within your facility by using a contained system, even when discharging (the Cone Valve comes with an outer lip seal on the Discharge Station to remove dust hazards and significantly reduce the risk of cross-contamination). Accurate dosing? The Cone Valve opens and closes vertically using natural gravity and the weight of the powder therefore it can also be shut-off stopping product flow completely at any time. This allows precisely measured amounts for batch dosing or the removal of part-used IBCs from the Discharge Station. In order for us to get the full picture of your materials, equipment and existing processes, we can carry out full-scale testing at one of our global testing facilities, before combining all the essential features of our modular systems to create the perfect production line. When in place and running, you can also choose to take advantage of our maintenance plans to keep your equipment in optimum condition ensuring that it consistently runs as smoothly as your powders flow. To start your companies journey on reducing waste, production down-time, operators and factory space to remain competitive, call one of our expert engineers who will be happy to advise and work with you to streamline your production processes.